Derek Jeter, New York Yankees captain and future hall of famer, took on-field batting practice on Wednesday for the first time since fracturing his ankle for the second time in mid-April. 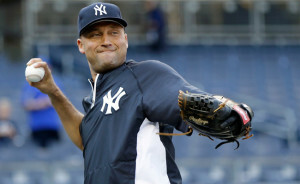 The Wednesday session serves as a positive step in the right direction for Jeter and the Yankees organization, as he continues to work out and strengthen his ankle at New York’s spring training complex in Tampa, Florida. Jeter took the field for the first time a week and a half ago, fielding grounders, taking swings, and completing a long toss session. Since returning to the field, Jeter has been taking swings off of a tee and has completed short fielding drills to increase his movement in the infield. On Monday, Jeter completed his first live batting practice session since re-injuring his ankle, followed by a lengthy base-running session on Tuesday. After visiting with Dr. Robert Anderson on Thursday, Jeter was given the clearance to move forward with baseball activities. Barring any setbacks or other unforeseen circumstances, Jeter is slated for a return to the New York active roster shortly after the All Star break in mid to late July.